Agh no this still exists! I have a memory. Let's try $450 then to even things out. Sorry for the delay. 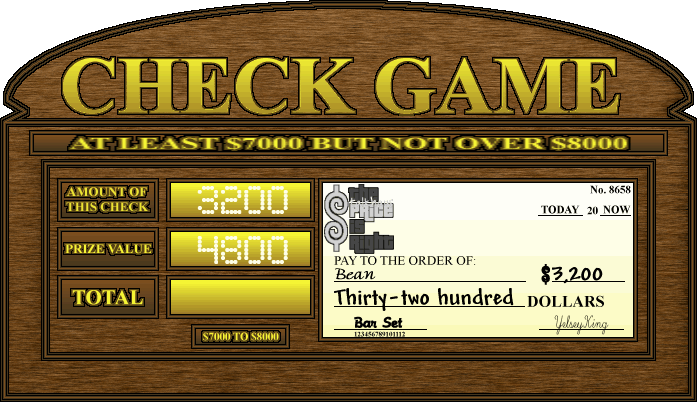 I've been very busy over the last few days not updating the Talkhaus Price is Right. 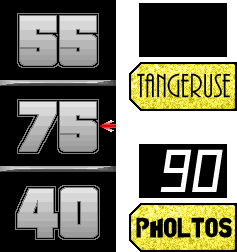 However, I'm pleased to report that I'm finally finished not updating the Talkhaus Price is Right, so I can finally update the Talkhaus Price is Right! At any rate, the actual retail price of that arcade machine is... *blinks* ...$2,200! Yikes! Bean, come on back up here! So quickly, too. And, once again, follow me up to the turntable, where I have a game, and a prize. Now, what is it, Meya? Meya: It's a new bar set! From Furniture Makers Inc, this lovely oak bar set, with four stools, wine rack, mini-fridge, and even soda fountain-style spigots with which to serve your favorite drinks, is sure make you the life of any party! Now, this game is simple. You can make out that giant novelty check up there for as much or as little as you want. Anything. But after that, we'll reveal the price of the bar set, and if that price, when added to the amount you wrote the check for, comes out to *anything* from $7,000 to $8,000, you win the bar set, *and* cash in the amount you wrote the check for. With that in mind... write that check! I'll write the check out for $3200 then! ...for a total of are you kidding me? Are you serious? *Exactly* $8,000! Not only are you a winner, you played a perfect game here! Are you psychic or something?! ... and this, my friend, is another of those moments! Re: The (Talkhaus) Price is Right Mini Ep. 2 - Wait... Showcase Showdown?! Ayjo: Contestants not appearing on today's show will receive Dippin' Dots. Those kinda candy kinda ice cream things. I've never eaten one. They have a fun name. Also, a t-shirt, with "I CAME ON TALKHAUS PRICE IS RIGHT, AND ALL I GOT IS THIS LOUSY T-SHIRT!" printed on it! I'm only here because Meya is too ladylike to mock contestants who didn't make it up on stage with insulting consolation prizes. And we're back with... hey, what's the big wheel doing on stage? This is a half-hour episode! There's no Showcase Showdown! Well, now there is. Because the show felt awfully empty without it. So how are we doing this? Well, the rules are the same. Contestants try to get as close to $1.00 without going over in one spin or two. This time, however, it's the *two* contestants who're closest to $1.00 who proceed to the Showcase. All other rules still apply, though: hitting $1.00 exactly gets you $1,000 and a bonus spin, where you could get $10,000 or even $25,000 more! And we're still going by "Forum Rules". 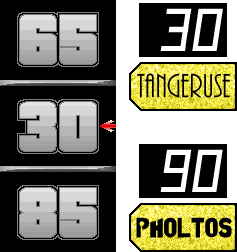 So, you pick a number from 1-20, and I'll work some math magic in conjunction with with random.org to determine what amount you get. It's all luck, anyhow. This just gives the players the feeling of... doing *something*. 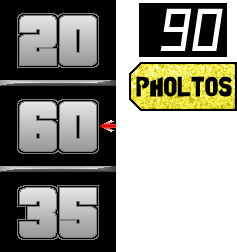 Anyway, pholtos will spin first, having won a whopping $50 on the punchboard. Followed by tangy, who won a sofa on Any Number, and finally, Bean, whose psychic powers led to a perfect Check Game. 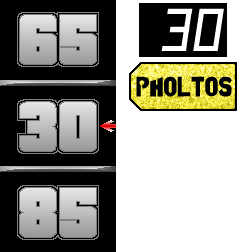 Spin it to win it, pholtos! so is that a 3? 30 cents. Call me crazy, but I assume you'll want to spin again? 60 cents, for a total of 90. Not too bad! Now, tangy, spin that wheel! Oh jeez I forgot about this. Calculations: 19 came up. 7+19=26, -20=6, x5=30. 75 cents... over by a lousy nickel. Well, I hope you had fun here anyhow, and... enjoy your sofa! Now, Bean. We know, by default, you're in the Showcase, as a result. Still, I'll give you one spin. If you hit $1.00, you'll still get the $1,000 and bonus spin. So... spin it! 14 came up. 1+14=15, x5=75, +30=THAT'S TOO MUCH!! Been waiting to drop a 13 on this all week! A whole dime. You've waited over a year for a whole freaking dime. But, well, you're still in the Showcase. Which will *finally* be happening! Back after these messages, which will not last more than a year, trust me. And we return. Finally. Ehem. Nothing out of the ordinary here. I digress. You should know how this works, but since I took a year's vacation in the middle of an episode, maybe you've forgotten. You'll both be shown showcases consisting of various fantastic(?) prizes. 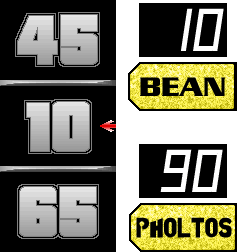 Since Bean is our big winner, what with that perfect playing of Check Game and all, he'll get to decide whether he wants to bid on that Showcase, or pass it off to pholtos and wait for the next one. 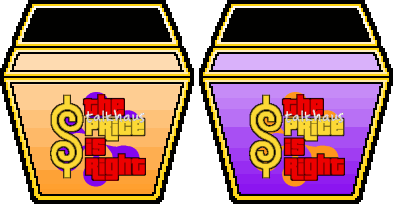 Regardless, you'll both bid on your respective Showcases, and the one who's closest to the actual retail value without going over is the winner. And as Bean well knows, if you're within $1,000 of the correct price, you win *both* Showcases. Now, Meya, what's our first Showcase? ...Ayjo? What the heck are you doing here? Where's Meya? Ayjo: The first Showcase is a journey through all four seasons! Starting with Winter, your first stop is... Alaska! You and a guest will spend five days and four nights in Hotel du Snow in Juneau, Alaska, where you'll enjoy skiing, sledding, hot cocoa, and... lots and lots of snow. Boots and snow pants not included. Tough luck. Ayjo: Next up, we head straight into Summer, which will be spent in beautiful Hawaii! Five more days and four more nights in the Aloha Hotel in Honolulu, where the order of the day is swimming, surfing, and sipping tropical drinks from a coconut shell as you lay on the beach. Watch out for them UV rays, though. Sunburns ain't pleasant. Ayjo: And finally, Spring is here, and how better to enjoy it than watching the cherry blossom trees bloom... in Japan! You know the routine by now. Five days, four nights in Hotel Tokyo, and it includes a trip through the famous Sakura Gardens! Something something anime! Ayjo: And this journey through the seasons can be yours... *if* the Price is Right! And there you go. Do you want to bid on this Showcase, Bean, or pass it off to the pink guy next to you?